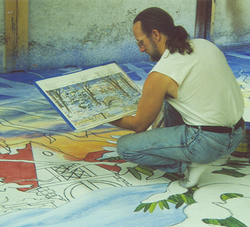 Daniel C. Nyiri is an award winning set designer and scenic artist in addition to being an award-winning watercolorist. Entirely self-taught, he spent many years developing his abilities as a freelance commercial artist producing more than 10,000 spot illustrations for advertising (distributed internationally) in addition to providing illustrations for several books, greeting cards and periodicals. Having worked primarily in pen and ink, he left commercial illustration to devote himself to painting. A request to help paint scenery for a local ballet company (where his daughter attended classes) evolved into a new career as a theatrical set designer, which eventually led to work in film and television. As a watercolorist he received First Place awards in two of the four competitions he entered early in his career and has twice had work displayed at the San Bernardino County Museum of Art. After selling over thirty-five paintings to collectors in the U.S., Europe, and the Middle East he ceased showing his work or accepting commissions. To all appearances he concentrated exclusively on his design work and only a small handful of people were aware that he continued to do any painting other than scenic. In late 2010, honoring a promise to a fellow artist, he once again decided to make his watercolor paintings accessible to the public. His credits for stage, ballet, film, and television total over 120 productions winning several awards and critic’s groups nominations. Amongst his ballet credits are The Firebird, Giselle, A Midsummer Night’s Dream, Alice in Wonderland, Three Virgins and a Devil, Dracula, Cinderella, Peter and the Wolf, Coppelia (which earned him a Lester Horton Award nomination for Dance design) and twelve different productions of The Nutcracker. Recent film work has included Production Designer for Australia’s first live-action 3-D feature film, Cane Toads: The Conquest and he has designed or art directed several Emmy winning films for PBS, National Geographic, Court TV, and commercials for clients as diverse as The Wisconsin Humane Society, Colonial Williamsburg, and the State of Florida. Other theatre credits include Sweeney Todd, The Crucible, Taming of the Shrew, Death of a Salesman (ITL award for design), The Inspector General (Los Angeles Weekly Critics nominee), The Glass Menagerie (ITL award for design), Guys & Dolls, Man of La Mancha, Fiddler on the Roof, The Wizard of Oz, Dark of the Moon, Macbeth, Frankenstein (ITL award for design), A Streetcar Named Desire, and Amadeus. Recently the artist has focused on film-making; writing, designing and directing his first full length feature film "Confession" http://www.imdb.com/title/tt6407942/?ref_=ext_shr_eml_tt. "I have always been aware that in the buildings we pass everyday, in the scenes of nature we often take for granted, however familiar, there can also be great mystery. Everything can be hiding something, and every place has a history of comings and goings – comedies, dramas and tragedies whose details we may never know but which occurred nevertheless. The hidden present and those unknown histories haunt me. Sometimes I place clues within the painting; it might be a half-concealed figure in a window, the shadow of someone or something just out of frame, drops of blood or symbols of violence, the manipulation of scale or the unexpected inclusion of elements or details disturbingly out of place; and sometimes it is simply by an emphasis on the atmosphere of the work, but it’s all there to subconsciously guide us back to the unquestioned mysteries. I attempt to allow each work to suggest a world of it’s own; however quiet or subtle, and whether intuitively, or intellectually, I invite the viewer to consider these mysteries, to ponder the emotions and feelings that are evoked. In essence I am attempting to reflect the sense memory of the place itself. What has it witnessed? What are the ghosts and histories that could be imagined to stain the cellular fabric of a specific location or object? To some degree I also paint memories - altered, re-arranged, reduced and filtered by our emotions and the situation at the time they are acquired. There is the truth of person, place or thing, the reality at the moment we encounter it, but that is invariably (and often immediately) changed by the observer in their own recollection. The mystery may lie not in the place itself but in the act of it being observed. I believe that for my paintings to be successful they have to lull you into calmly accepting them and the more comfortable you become with them, that’s when they begin to affect you in ways you never would have anticipated upon first viewing. They settle into your subconscious and elicit emotions and suggest emotional responses. Carefully editing and controlling the reality depicted, while working the abstract compositional elements to subconsciously assert themselves allows the paintings to whisper to you, perhaps even revealing their mysteries. Our whole existence is no more concrete than the memories left behind. We are temporarily tangible ghosts drifting through an impermanent world deluding ourselves that we have permanence"